Turkey's President Recep Tayyip Erdogan speaks at a ceremony for judicial appointments in Ankara, March 19, 2018. Erdogan said following victory in Syria's Afrin region, his country will expand its military operations into other Kurdish-held areas in Syria as well as in Iraq's Sinjar region. Turkish President Recep Tayyip Erdogan vowed Monday to expand Ankara's military operations against more Kurdish strongholds in Syria, after ousting Kurds from their enclave in Afrin. Erdogan said Turkish forces would target the Syrian city of Manbij, along with Ayn al-Arab, also known as Kobani, and other towns along the Turkish-Syrian border to the east of the Euphrates River. The expanded fight could lead to conflict with the United States, a NATO ally. The border region is controlled by U.S.-backed Syrian Kurdish forces, with U.S. troops stationed in Manbij as part of the effort to eradicate the Islamic State terrorist group. “We've made it very clear that they're there," Pentagon spokesman Col. Rob Manning told reporters Monday, adding the U.S. defense officials remain in close contact with their Turkish counterparts. U.S. officials are also concerned about a possible worsening of the humanitarian situation in Afrin, where reports have emerged that civilians no longer have access to clean, drinkable water. "It appears the majority of the population of the city, which is predominantly Kurdish, evacuated under threat of attack from Turkish military forces and Turkish-backed opposition forces,” said State Department spokesperson Heather Nauert. "This adds to the already concerning humanitarian situation in the area"
Turkish President Erdogan also threatened to expand the military operations into Iraq in an attempt to drive out Kurdish militants from the Sinjar region if the Iraqi government proves unwilling to engage them. Turkey claims the region is a staging area for outlawed Kurdish rebels who have been waging a fight for more than three decades to control southeastern Turkey. "One night, we could suddenly enter Sinjar," Erdogan said. 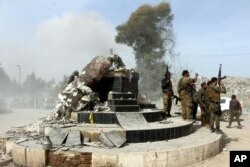 Turkey-backed Free Syrian Army soldiers celebrate around a statue of Kawa, a mythology figure in Kurdish culture, after destroying it in the city center of Afrin, northwestern Syria, March 18, 2018. Despite the operations inside Syria, Erdogan said Turkey has no intention of "invading" Syria, claiming his country is just clearing the region of those he considers terrorists. Turkey's state-run news agency said a booby-trapped bomb reportedly left by Syrian Kurdish fighters in a four-story building in Afrin killed 11 people late Sunday, including seven civilians and four Turkish-backed fighters. Turkish forces and Syrian opposition fighters allied with Ankara had advanced Sunday into Afrin after a nearly two-month-long campaign. Federica Mogherini, the European Union's top diplomat, criticized Turkey's expanded operations along the Syrian border. "I am worried about this," Mogherini said in Brussels. She said international efforts in the seven-year conflict in Syria are "aiming at de-escalating the military activities and not escalating them." U.S. defense officials have likewise expressed concern, saying the conflict between Turkey and Kurdish forces could give IS a chance to re-emerge.